Between the publication of Kant’s Critique of Pure Reason in 1781 and Husserl’s Ideas in 1913, the nineteenth century was a pivotal period in the philosophy of mind, witnessing the emergence of the phenomenological and analytical traditions that continue to shape philosophical debate in fundamental ways. The nineteenth century also challenged many prevailing assumptions about the transparency of the mind, particularly in the ideas of Nietzsche and Freud, whilst at the same time witnessing the birth of modern psychology in the work of William James. 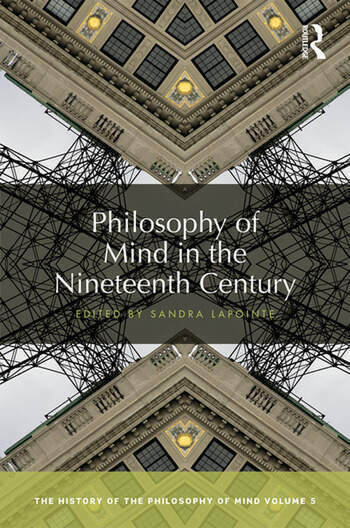 Covering the main figures of German idealism to the birth of the phenomenological movement under Brentano and Husserl, Philosophy of Mind in the Nineteenth Century provides an outstanding survey to these new directions in philosophy of mind. Essential reading for students and researchers in philosophy of mind, continental philosophy, and the history of philosophy, Philosophy of Mind in the Nineteenth Century is also a valuable resource for those in related disciplines such as psychology, religion, and literature. 14. Natorp’s Two-Dimensional Mind Alan Kim. Sandra Lapointe is Associate Professor of Philosophy at McMaster University, Canada. A Commonwealth Alumna and Fellow of the Humboldt Foundation, she has published extensively in the history of nineteenth- and twentieth-century philosophy of logic, language, and mind. She is a founding associate editor of the Journal for the History of Analytical Philosophy and the founding president of the Society for the Study of the History of Analytical Philosophy.